Danish cargo bikes have been around for a century or so. There is a wealth of choice on the market but innovation - apart from using modern materials - has not been that progressive. 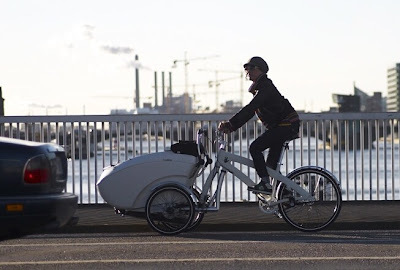 With it's splendid design and brilliant flexibility, the Triobike is muscleing its way onto the international cargo bike scene. Based in the heart of Copenhagen, the Triobike is everything Danish Design is world-renowned for; simplicity, functionality and coolness. If you haven't sussed it out yet, the Triobike is a three-in-one extravanganza of bikealiciousness. You can transport your kids to kindergarten or school in the cargo bike incarnation and drop them off. Instead of riding the cargo bike around all day you merely pull out a front wheel from under the cargo bay, detach the front forks from the cargo and pop on the front wheel. Off you go, riding to work on a proper bike. If you fancy going for a walk, you can merely use the cargo part as a stroller. It's all so easy that it's amazing nobody thought of it before now. The Triobike is currently in version 2.0. There were minor design issues in the first generation but they have been lovingly sorted out in this new version. By all accounts, Danish distributors are snapping them up like warm bread - as they say in Danish. There are many reasons why we love the Triobike. It's cool, it's different, it's three-in-one. Then there are the plusses regarding the ride - very smooth and definately comparable to other leading brands of Danish cargo bikes - and the ease of switching from one version to another. [See a film about it on their website] In short, the Triobike is an urban cargo bike hybrid dream. Still rockbottom cheap compared to a small car. The clever thing is that you can buy two bikes and one cargo bay. That way dad can drop off the kids, ride off on his bike to work and mum can pick them up on her bike in the afternoon. Oh, goodness me, we like the Triobike. Besides the bike, they have the coolest logo in the Danish cargo bike world and the most modern website [although it's not very Firefox friendly]. Me and wifealiciousness are talking about getting a cargo bike now that we have two kids. Let's see what we end up with. Watch this space. We'll tell you all about it when it happens. Check out Triobike's groovy website here... just choose your flag. They have loads of cool photos and all the specs regarding their three-wheeled wonder.